Source of the post Yeah. project starshot's thrusters are "photon thrusters" which also violate those laws, because light doesn't have any mass so newton's laws just got broken. It sort of works with the second law of thermodynamics. and of coarse doesn't have anything to do with coulomb's law. so how does it move? I know that it's because light has inertia, but that still shouldn't do anything because light still doesn't have any mass. so how does it push? Light has energy. And according to the formula E = MC² energy is synonymous with mass! In other words, if photons were slower than light, they would have mass. But because they move with light speed, they are completely energy. But that's why it can still push. Source of the post Yeah. project starshot's thrusters are "photon thrusters" which also violate those laws, because light doesn't have any mass so newton's laws just got broken. Photons are massless, but not momentum-less. They have momentum of p=E/c. That photons carry momentum and apply pressure is a basic fact of electromagnetism, and can be demonstrated in the lab using lasers and sensitive equipment. I saw you just deleted your post saying that photons can't apply pressure because they are massless, so in case this was still unclear, the reason is that pressure is force per area, and by definition, force is the rate of change of momentum with time. Photons transfer momentum, therefore they apply pressure. This is an experimental fact and we can calculate it as well. The momentum of a photon is p=E/c. If a light beam has some power P, then the momentum it transfers per unit time is dp/dt = d(E/c)/dt = P/c. But change in momentum with time (dp/dt) is force! Therefore the light beam applies a force of P/c if absorbed by a material. If reflected, then conservation of momentum results in twice the amount of force. Force per unit area is pressure, (I'm running out of letter P's here, so let's use bold P for pressure), and the pressure applied by the light beam is P = F/A = (dp/dt)/A = (P/c)/A = I/c where I is the intensity (e.g. watts per square meter). Again double that if reflected. What?! but yeah I understand how the photons work now but does this mean that light pushes oxygen atoms and we just didn't notice all this time? does this mean that light can cause atomic erosion? Last edited by Propulsion Disk on 27 Jun 2018 06:32, edited 2 times in total. Light scattering off of atoms does impart a force on them, but for visible light on air, the effect is very small and not easily noticeable. Take for example a 500nm photon scattering off of an oxygen molecule. The momentum of this photon is 1.3x10-27 Newton-seconds, and if scattered by 180°, then it would change the velocity of the oxygen molecule by about 2.5 cm/s. This is a very tiny fraction of the average velocity of oxygen molecules in air at room temperature (nearly 500 m/s). You might think that with so many photons of sunlight streaming in constantly, the effect would build up and blow all the air away, but what instead happens is that because the atoms are also quickly colliding with one another, any additional velocity gained through scattering photons is quickly converted into random (thermal) motions of the atoms and re-radiated as heat. So no net effect is accumulated. An example of where the pressure applied by light on atoms does become noticeable is clouds of gas around hot stars. In those environments the light can be very effective at pushing the surrounding gas away. Another important example is the stars themselves -- it is literally the radiation pressure supplied by all the photons streaming outward from the core that supports a star against collapsing by its own gravity. Source of the post does this mean that light can cause atomic erosion? What do you mean by atomic erosion? Source of the post What do you mean by atomic erosion? Atomic erosion is when atoms get destroyed by pressure. for instance, if you break a wooden board, atomic erosion would happen as you break the board. so pretty much what atomic erosion is when things break apart, when things break, the atoms that join the two parts of the wooden board together get destroyed when you break it. this also happens when you rub on anything, your destroying a few atoms, in fact, when you touch anything you destroy a few atoms. this is the reason we get numb from doing things like that, we are rubbing with our skin and our skin rubs on our nerves which causes atomic erosion on your nerves the most because they're way less dense than our skin is, good thing our body's can heal or we would be numb all over every morning! so now you know that when you touch ANYTHING you actually destroyed it a little, but just a little. You're talking about bonds breaking, not atoms being destroyed. If a photon breaks atomic bonds it is called photodissociation. It requires photons of sufficient energy. For example, ultraviolet photons can dissociate ozone (O3) molecules in the atmosphere. Sufficiently energetic photons can also eject electrons from atoms. This is the photoelectric effect and is related to the earlier discussion of the work function for metals. It typically requires energies of a few electron volts or greater. For example, the work function for mercury metal is 4.5 eV. Source of the post You're talking about bonds breaking, not atoms being destroyed. If a photon breaks atomic bonds it is called photodissociation. It requires photons of sufficient energy. For example, ultraviolet photons can dissociate ozone (O3) molecules in the atmosphere.Sufficiently energetic photons can also eject electrons from atoms. This is the photoelectric effect and is related to the earlier discussion of the work function for metals. It typically requires energies of a few electron volts or greater. For example, the work function for mercury metal is 4.5 eV. I just double checked and it's atomic PARTICLE erosion so that means that the electrons are what get eroded. Source of the post I just double checked and it's atomic PARTICLE erosion so that means that the electrons are what get eroded. Exactly. In the case of starshot you are dealing with so called sputtering. Cosmic rays and stellar wind particles moving through interstellar space can indeed erode the surface of those coatings, but nut by "eroding atoms" but by ejecting them. Even then, the main source of erosion for starshot in interstellar space are particles in scale of dust not in molecular or atomic scale. Dust particles can damage the sail at relativistic speeds but they have calculated that it can be handled (a microscopic hole in the sail is not so important but many could be) by reshaping the sail, building it with self-healing materials or even by clearing the path with the ground-based laser at least for the interplanetary traverse before exiting the solar system. Photonic sputtering also exists but is a very rare phenomenon and does not play an importat role at all in the erosion of the coating. It's importat to note that atoms DO NOT erode. I mean, erosion is a very macroscopic concept, it involves the degradation or dilution of matter. You can't apply that concept to atoms. Atoms can be ionized, their nucleai can be split etc.. but an atom is an atom and elementary particles can be separated and the atom as a system can cease to exist but the idea of it been degraded by the effects of time is quite strange. Erosion is the classical phenomen that can be pointed as an example of emergence in complex systems. Atoms are in far away from physical complexity, that's why emergent properties cease to make sense (not only erosion, also temperature and even the row of time as many think). Wouldn't actual atomic erosion be fission? I sure hope I don't have any of that going on in my fingertips! I think I would recommend avoiding using the word "erosion" to anything involving atoms, like FFT said. To apply it to atoms doesn't make much sense and I've never seen it used in the scientific jargon. Hence my earlier question about what Propulsion Disk was imagining. All processes involving nuclei splitting, atoms knocked off a material, electrons being removed from atoms, bonds breaking, etc, have other names for them. Source of the post I think I would recommend avoiding using the word "erosion" to anything involving atoms, like FFT said. To apply it to atoms doesn't make much sense and I've never seen it used in the scientific jargon. Hence my earlier question about what Propulsion Disk was imagining. All processes involving nuclei splitting, atoms knocked off a material, electrons being removed from atoms, bonds breaking, etc, have other names for them. Yeah I corrected myself on that, I said on my last post that it's atomic PARTICLE erosion which means electrons get eroded by the things in space. I would like to know the names for atoms being knocked off, bonds breaking, you know the stuff you mentioned, also you said that there is another word for "electrons being removed from atoms" other then erosion or ionization so I would really want to know what it is. (PS) I read "atomic particle erosion" on the Wikipedia so if it's not reliable when it comes to science then can you help with the question that I had in "science and astronomy questions?" It would really help. Removal of electrons from an atom = ionization, or photoelectric effect in the context of electrons ejected from a material by shining light on it. Wikipedia is a good resource, but it isn't perfect. I often use it myself. Even in technical science and math articles there can sometimes be errors, so you just have to be careful. Same goes for textbooks and everything else. From what I can tell "Atomic Particle Erosion" only appear as one bit of text in one article, rather than being its own article about a process. I wouldn't call this an error so much as a sloppy use of terminology. It isn't a big deal other than it can cause confusion. Based on the reference I think what they are actually talking about is sputtering, or "erosion of the material by particle strikes". I also don't think they're talking about electrons being ejected (again that happens with energies of a few electron volts, whereas a 0.2c collision with even a single proton involves far greater energy than that). I left a suggestion in the Q&A thread. I know we said this several times now but I want to emphasize this. If atomic erosion is a strange use of the term "erosion" then electron erosion is just totally wrong. Electrons are elementary particles, they do not erode. If you have a strange substance made of billions of electrons then yeah, you could say that de substance can be eroded, electrons can be lost, electrons can be dispersed with time by mechanical or electromagnetic forces, but that is the erosion of your special "electron substance" in the best case, no erosion of the electrons themselves. No electron is different from any other electron in the entire cosmos (besides their location in space). They all have the same mass, the same charge and the same spin. An electron "eroding" would transform into what? what aditional feature would change so you can discern between a fresh new electron and an eroded one? would lose what? mass? charge? then is not an elecron anymore (ignoring the fact that electron's charge is a quanta and it can't be lost). Would they change form? their rought spherical surfaces would be polished by erosion? No, because they don't have texture, they don't have any geometrical form associated with them. The representation of electrons as colored tiny spheres is just misleading when it comes to this. They are just that, a mass, a charge and a precise spin combined. They are elementary particles, fundamental blocks of nature. You can disarange a collection of fundamental blocks but you can't disarange them one by one because they are just that, elemetary in nature and all identical with one another. If they could be eroded then electrons wouldn't be elementary particles, they could be split in more elementary pieces so they would be complex composite objects. But there is not a single line of evidence pointing to that and there is no theoretical backup for that idea either so talking about erosion at this scale is just wrong. Do you have a LCD TV screen near you? Take a close look to the screen (with a magnifying glass if you can). You would notice that the image is generated by small elementary pixels. 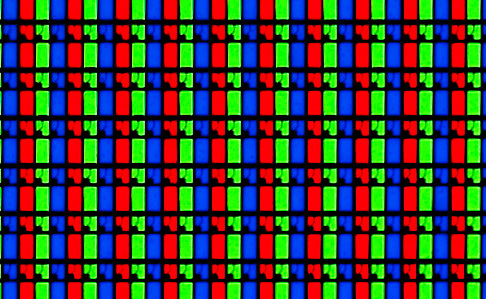 Each pixel has 3 properties, or in this case 3 colors, red, green and blue, that light up in a controled fashion. As you can see there is no yellow color. But your screen is sure capable of producing yellow tones, and orange, and purple, and black. Where are these colors coming from if your screen is just a collection of red, green, blue lightbulbs? Well, one way of saying it is that yellow it's coming from complexity of the system. The arrangement of pixels, their lighting patterns can generate an emergent property in a macroscopic scale that is an entire new color, and that color is something more than the sum of the colors each pixel has. Your screen is a complex system, your pixels are not, they are "the elementary particles" of the "TV screen universe". So, does one pixel has yellow in it somewhere? No. Does one pixel has the potentiality of yellow in it? No. There is some essence of yelowness in each pixel? No. Is complexity the one that generated the yellow color in your screen (it could be regarded as an effect that has to do with the integration in time and frequency domain of our visual system, don't think of it as ghostly appearence, but in the end is just an emergent feature of a complex system). The same works with the mind. Do you think a neuron has conciusness? or intelligence? No, they only perform chemical reactions. But when you contemplate the macroscopic scale of an array of billions of neurons firing with certain patterns then an emergent property comes out. Intelligence and counciousness could only be that, an emergent property of a vast collection of neurons. Neurons don't have intelligence as the pixels lack yellow, but complexity bring both to life. I recognize that there is also a semantic issue here in the case of atoms (since atoms can be dissasembled because they are a little higher in the staircase of complexity when compared to electrons). There is also a debate on the metaphysics of identity. A rock can lose it's pointy shape while been eroded by a river and lose some mass (grains are been stripped from the rock itself) but still be considered and categorised as a rock. An atom is not like that. If an hydrogen atom lose an electron it's strange to call it an atom anymore because it's just a proton. If an hydrogen atom loses it's proton then you just have an electron, so it is difficult to follow the idea of erosion here, just as a non-alcoholic Cuba Libre is just Coca-Cola. But I don't care about this since methaphysics shouldn't be part of any rational discussion. I care about aplying macroscopic behaviours to sub-atomic particles.